Sometimes I cook a dish and wonder why I haven't been eating it all the time. 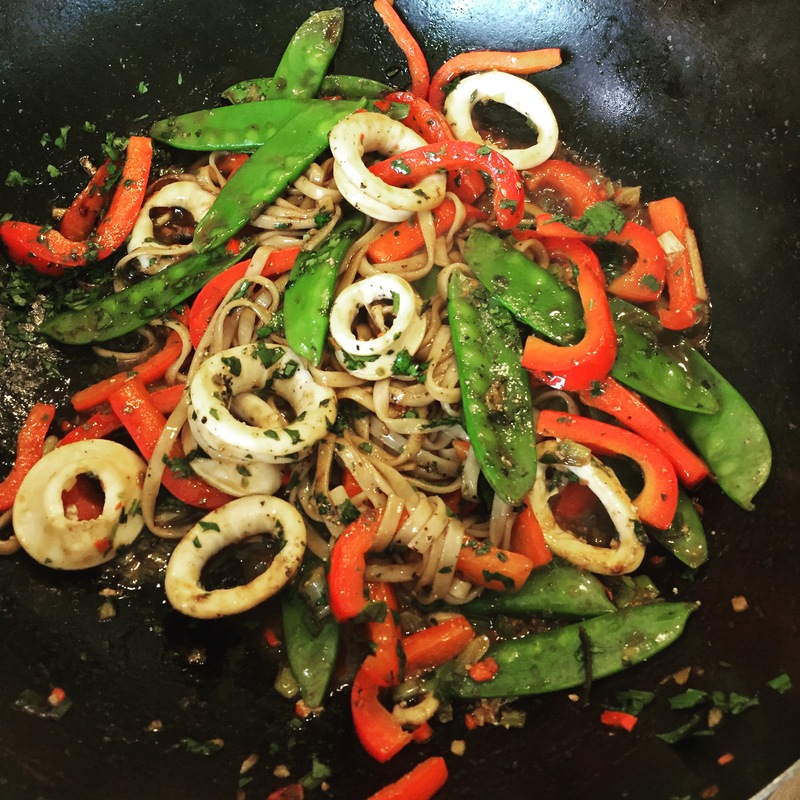 This spicy squid stir fry is one of those dishes. It's low calorie, contains 2 of your 5 a day and takes me 15 minutes from start to finish to cook and serve it (I've taken longer making sandwiches). Oh and did I mention, it is delicious. Us Brits have an interesting relationship with Squid. Although we’ll happily tuck into a bowl of calamari while enjoying a glass of sangria on our holidays, very little is bought and cooked at home in this country. I think that is a real shame. 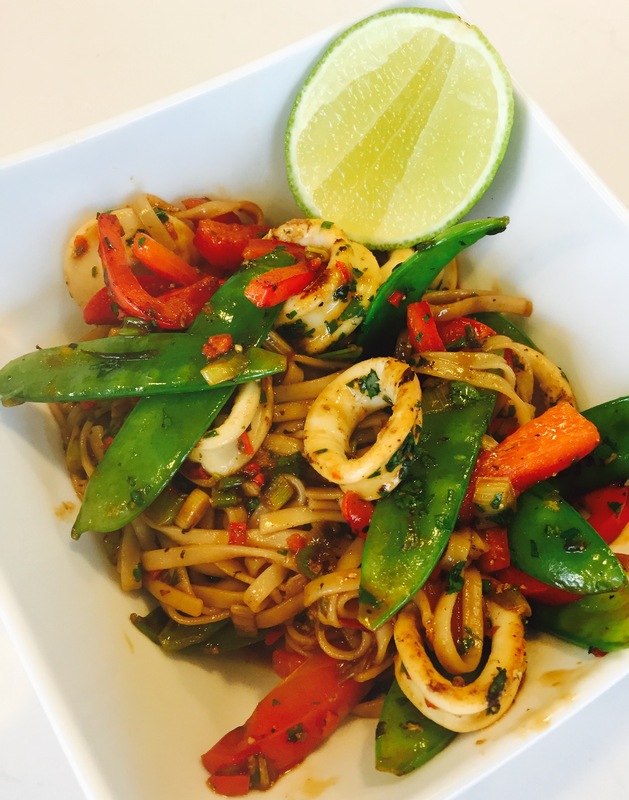 Frozen squid is typically caught in the pacific ocean where it is very sustainable and it makes a great staple for your freezer. At less than 100 calories per 100g it makes a great base for a healthy stir fry that you can then pack out with veg. Red peppers and mange tout were my beg of choice in this recipe but there are usually lots of alternatives in my fridge I could have used instead – a shredded leek, some sliced up aubergine or mushrooms, halved baby corn would work really well or even some florets of broccoli. All of which would be delicious so feel free to change it around to suit what you have. I also wanted to make sure that this was the sort of healthy mid week meal that could be thrown together without much thought or shopping for last minute ingredients. To that aim, I’ve kept the flavourings simple with just some soy sauce, lime and some sesame oil. You could leave the sesame oil out if you didn’t have it in and although I think coriander works best in this dish I’ve also made it with parsley which works fine well as well. No fresh chilli then use dried chilli flakes. This recipe is also very easily halved for a solo dinner. The version you see in the photo was prepared with udon noodles but use whatever noodles you have to hand. My favourite are actually soba noodles but annoyingly they don’t photograph very well. Hope this recipe will become one of your favourites as well. Now just wondering if I can justify eating this for dinner 3 days in a row? First prepare all your vegetables so they are ready – slice the red pepper and the spring onions, finely chop the chilli, crush the clove of garlic, separate the leaves and stalks of the coriander and slice the stalks and chop the leaves. Defrost and drain the squid if using frozen. Cook the noodles according to the instructions on the packet. If you’re not going to use them straight away rinse under cold water to stop them cooking. Heat a wok or large frying pan with the oil. When hot add the chilli, garlic and coriander stalks and fry for 1 minutes. Keep the mixture moving so the garlic doesn’t burn. Add the pepper, spring onion and mangetout or sugar snap peas and continue to stir fry for a couple of minutes until the vegetables are soft. Now add the squid rings and cook for another 1 to 1.5 minutes. You want the squid to turn from translucent to fully white. Don’t over cook at this stage or the squid can become rubbery. As soon as the squid is cooked through add the noodles, soy sauce, lime juice and sesame oil with a good grinding of black pepper. The dish doesn’t need salt as the soy sauce is salty enough. Stir until all combined and heated through (if using cold noodles). Scatter with the coriander and serve with extra lime for squeezing over if desired.